If you’ve ever had difficulty meditating, this experience may be just what you’re looking for. Attain the deep relaxation and inner peace that meditation provides while receiving the benefits of sound healing. 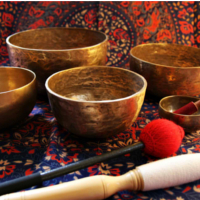 Sacred Sound Meditation incorporates Tibetan singing bowls, wind chimes, wind gongs, and rain-sticks, along with some spoken word or guided meditation, depending on the specific session. These particular sounds create an equilibrium in the brain by allowing deep relaxation to be felt throughout the body. Please join us for this experience. Instructor: Michael Burke has been a sound therapy practitioner for over 10 years and is a member of ISTA (International Sound Therapy Association). He’s a published poet and has been creating poetry since childhood. Today, Michael performs his poetry pieces during live meditations and is currently the director of The Sound Ministry at Unity North Atlanta.